Lon - I'm an avid reader of your site and thoroughly enjoy hearing other peoples experiences. Thanks for doing what you do - it helps me understand this mysterious world. Anyway, back in the summer of 2005, I had a very unusual sighting, yet it was almost something of a blessing to witness (especially having such high hopes for such an existence!). Myself and an entire group of people witnessed a fairy close up. Nobody knew what to say. It started with a phone call from a friend, inviting me and my girlfriend at the time out to his parents house in the country areas of Chicora, PA (which has had many other odd occurrences and sightings - Batsquatch as I can most recently recall). We accompanied a gathering of about 7 or 8 of us in total. It was a casual evening, nothing crazy and no drugs to induce any hallucinations. We sat on his parents back porch as the sun set behind the trees (it was a nice house set in a thick wooded area) and carried on conversation amongst friends. Night came and nothing much else changed. This porch was more of a deck. It was roughly 10x15 which was a nice spread for all of us to gather around a table on. To the far side of the deck (which was right across from where I was sitting), my friends mom had a huge pile of pots and plants that rested against the railing of the deck and the house, all of which sat right under the spot light for the deck, so our area (the deck) was very clearly visible in the dark. At this point, it was probably around 10pm considering that it was almost pitch black outside. Suddenly, during one of those odd quiet moments in conversation, we heard a pot "tink" as if it were lightly bumped. Being out in the woods in the dark, all of us turned to see what kind of animal was spying on us. To our surprise, as we all turned to look (and mind you I had a front row seat the whole time), we saw what looked like either an enormous moth (and I've seen big moths, this thing was more like a squirrels size) or a rather large bat shoot straight up from the pile of pots. However, this thing obviously had wings that were wrapped around its body like a tortilla - but I immediately noticed something that blew my mind - a human head with extremely long pointed ears, almost as if they were to be disguised as antennas. However, there was no "human" hair on this creature... So, it shot straight up from the pile of pots, but what happened next totally threw us all in a spin. It reached it's maximum "launch" height, and hung suspended in mid air for about half a second when suddenly its wings burst open into a full spread, RIGHT in front of the porch spot light. I could not believe what I was seeing - it was a perfect slender human female body with wings attached along the entire side of it's body, from fingertips to toes and then some. "Her" body was solid and silhouetted against the light, but her wings resembled the skin of an ear lobe, almost like a bats wings. Being in front of the light, I could somewhat see through her wings and actually saw the veins that carried blood throughout her body. Her skin I assume was a pale green pigment, and I say "assume" because her entire body and wings were covered in what looked like tiny white hairs - but there was something "magical" seeming about her hair because it carried a definite soft green glow around her entire entity. I drew pictures to try to describe how she at first appeared wrapped up in her wings, and then how she opened up to a full spread "X" figure. She was a combination of human and butterfly, with a biological twist of bat. Now, biologically, I'd say she had the body density and weight of a good sized squirrel. About 1 foot in height and body proportions that seemed identical to a human... 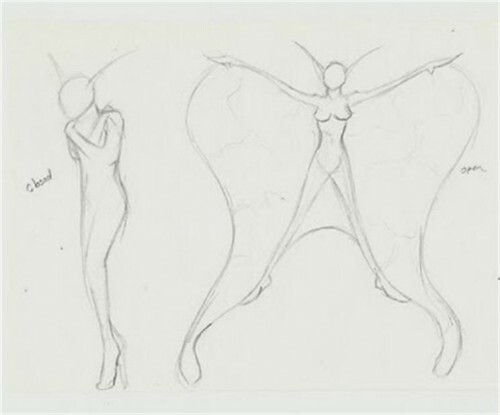 The wings were so oddly beautiful in design the way they attached to her body and "stretched" at full wing span (which she had to do by opening both her arms and legs to get this full effect). Now here's the next part that just doesn't make sense - like I said, when she first shot out of the pots, she hit a high point where she was suspended in mid air for about half a second and the burst open in an instant to reveal her truly graceful form, which again she hung in mid air for another half second, making an overall 1.0 - 1.3 seconds of hang time (I try to be so accurate with timing because I am an animator and it's ALL about timing, so I think I should be pretty accurate with that guess). But after she showed herself in this full spread form, as heavy as she seemed to be (having the seemingly biological makeup that I observed), she defied gravity and "fluttered" right over top of the table, over top of all of us (about 4 feet above the table), and off the deck and into the woods. From point A (the pots on the porch) to point B (the woods) she probably fluttered for about 7-10 seconds. It was dark outside so once she left the confines of the porch, she left the radius of light that we could see in from the spot light on the porch. She was gone in an instant once she crossed that line. All of us sat silent for about 30 seconds, jaws wide open, until someone burst into, "Holy shits!" and the sort. We all fumbled for an explanation for about 5-10 minutes before we all just decided to accept what we saw - a fairy. Not one of us thought it anything else... Like I said, it for one split second while wrapped up in its wings resembled a GIANT moth or bat, but I could see that human head and instantly knew it was a humanoid. And once she opened her body to reveal her true form, there was no mistake - it was a real life fairy. Absolutely beautiful.